What makes Fedena so amazing? Definitely, its interesting features and plugins that give its users a smooth and enriched experience of managing their institution effortlessly. 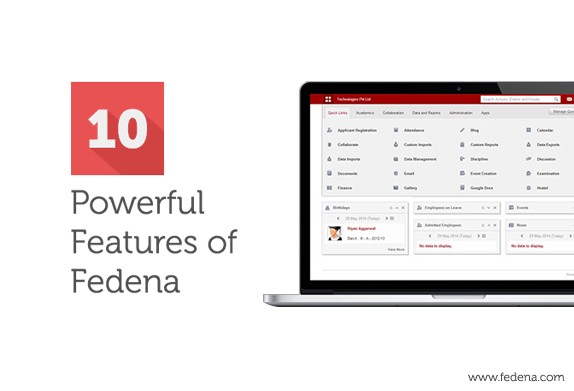 Today, in this article, we will highlight some of those features that makes fedena to stand out of all! Data Palette: The Future of Fedena: Fedena 3.0 offers an exciting new feature called the Data Palette which when enabled will help you get the new dashboard. The dashlets available on the dashboard are manageable and they get updated in real time. Moreover, information in the dashlets can be navigated according to a desired date. Data export plugin: Worried about exporting data from Fedena and storing them in your system for further use? Fedena’s data export plugin would facilitate in exporting data. You can store in data in CSV or XML format by exporting them from Fedena and keep them in store for future usage. Consolidated reports of school via the report center: You can avail a CSV file for all possible reports, thus letting you get access to a whole lot of data. So, whether its a detail of all the students or the batches and courses that you have in your institution, you can have a report of it in the CSV format anytime. Sign in with your google account: Fedena’s Google app integration lets you use your Google account to login to your Fedena account. All your worries of forgetting your Fedena login details now has a smart solution. Use your Gmail account to login and use your Fedena account. For more details, click here. Registration plugin with Payment gateway integration: Applicants to your institution can now pay their fee instantly for registration without coming to the institution physically to do so. The registration plugin of Fedena is now equipped with payment gateway that lets a student pay online for registration to the institution. The barcode integration: Now you have a smarter way to keep a track of all the library books using the barcode integration. Any new book added or a book being allocated to anyone in the institution can be kept in a record with the barcode integration. A time saving feature that can save you from spending hours noting down all book entries. Custom report: The interesting custom report plugin by Fedena can help you to create report card of students or employees on the basis of particular information. For example, you can create a report of students who belong to the blood group B+ along with their first names, date of birth and gender. Just select the respective info based on which you want the report. Know more. Action search: Having problem with Timetable creation or extracting Fee Defaulters list? Your solution is the Action Search that is available in the top right-hand side. This innovative feature let the users to get access to various other features through a simple search. All you need to do is to type what you want to do with Fedena and get all the matching actions listed quickly. Form Builder: An upcoming feature by Fedena, the Form Builder helps in creating forms and sharing it with fedena users. The forms can be created by the admin or the privileged user and can be used as feedback from students about the classroom teaching and others. Classroom allocation: Another interesting feature coming up very soon in Fedena is the Classroom Allocation with which you can allocate classroom for any particular subject to students and teachers as well. Based on a timetable entry, classroom can be allocated on a weekly or a specific date basis. After a room is allocated using the drag and drop method, the same can be done for students and teachers to complete the process.